The other thread about whether we trusted our car mechanics made me think about what the dealer told me on my last visit. I can't recall exactly but I think he said one of the motor mounts was cracked on my 2002 Volvo S60. He said it should be replaced at some point but it didn't need to be done immediately. Can someone tell me about when I why I need to fix the motor mount? I don't want to defer too much maintenance and not be taking proper care of the car I want to last another 100,000 miles. Repairs aren't cheap but neither are new cars! A broken motor mount will often lead to excess vibration and noise. If the motor shifts position, there could be problems with the linkage to the tranmission. I suppose in an extreme case, jamming on the brakes will slow the car but the motor could keep going into the radiator and beyond. Unless you are planning to get rid of the car, look at it, and if you confirm that it is cracked, replace it. It can't heal itself. I definitely don't want to be putting any extra wear and tear on anything related to the transmission. Penny wise and pound foolish. Motor mounts also prevent engine torque from allowing the engine to lift off the mount and slightly rotating during hard acceleration [if it breaks on the correct side] It could stay just cracked for a long time and do it's job, but why did it crack to begin with? Old? fatigued? etc. I would get it fixed soon if possible. They sent out a coupon ($25 off $150) so maybe I'll go ahead and get it done before the coupon expires. Is 11 year-old car with 155,000 miles a good excuse for a cracked motor mount? Ok. I'm making an appointment tomorrow! I would have the mechanic or dealer show you the cracked mount and if it is indeed cracked, get it replaced pronto. If you have any doubts, take it to another shop and have it checked out and get a second opinion. I have been told that on my 11 year old honda civic, 86000 miles. Took it to a second garage that I actually trust, and they laughed after inspecting it. All motor mounts looked and felt solid. Maybe the dealer used x-ray tomography or ultrasound and the independent garage only had a pair of eyeballs and a screwdriver to poke it? Verifying the condition of the motor mounts is often a straightforward flashlight and hand mirror job. (Although you may need to drive two wheels up on a curb to get in position on the ground to see a mount at the rear of the engine.) Have a buddy grab the engine with both hands and try to shake it with enough force so you can see the mount move a little as you inspect it. 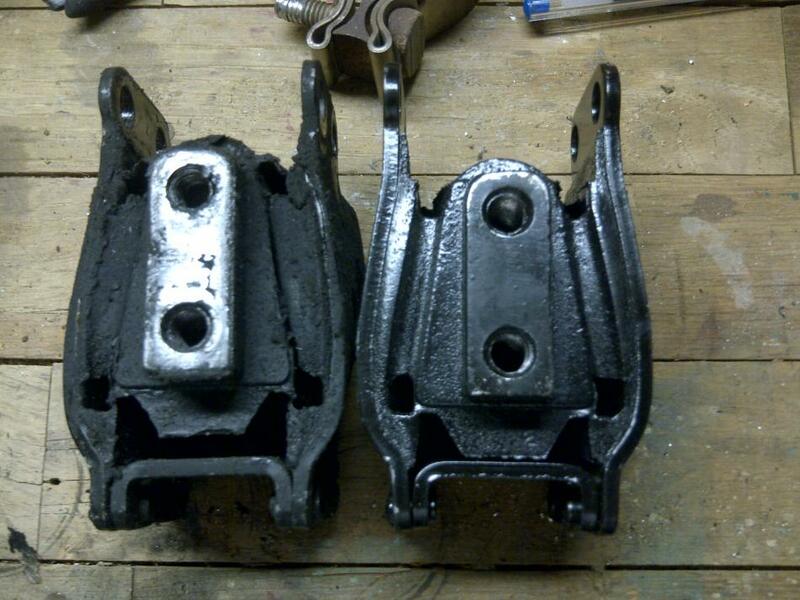 This is a picture of a motorcycle mount, but the "cracked" condition of the unit on the left is plainly evident. How they work...The inner metal part connects to the engine with a bolt. More bolts connect the outer metal part to the vehicle frame. (Or vice versa.) Over a period of years and miles, the heat and the vibration of the engine causes the rubber doughnut of cushioning material in between the metal pieces to get stiff and crack. Without the cushion intact, the movement of the inner and outer pieces is greater. This leads to the vibration, sound effects and collateral damage described by the other posters. Consider getting all of the motor mounts changed at the same time. The brand new mount will be stronger and more resilient than the older one, which will amplify the stresses on the old one and hasten its failure. BTW, any competent mechanic can change motor mounts. I personally wouldn't feel at all inclined to use a high-priced dealer or brand-specialist mechanic. Back in the old days when we had carburetors under our car hoods, a broken motor mount (nearly always on the driver's side of the engine), the carb/throttle linkage would/could get stuck, causing the gas pedal to get stuck, with the pedal not coming back up even when you took your foot off of it. Not a good thing. I speak from experience. When I was a teenager, I had a '67 Ford Custom 500. That was my first car. It had no AC, no power steering or brakes, no automatic transmission (had 3 on the tree), no radio....had basically just an engine, seats & a steering wheel...lol. Being a typical teenage boy, I drove the crap outta it. I was constantly revving the engine (289 v-8) & dumping the clutch, so I could burn the tires off at a premature rate. Of course I didn't care about that, because....I was a dumb teenage boy. All that clutch abuse caused my driver's side motor mount to break. The reason being that the engine naturally torques from one side to the other when it's revved....lifting up on one side, trying to rotate to the other side. Anyhow...it broke the motor mount. Being the inventive, yet poor teenager I was, I had previously purchased & installed a classy chrome barefoot-shaped gas pedal for my cool car. It looked like a foot, including toes. Still available, Marty, for only $14.95 at the Moon Eyes web site. Wow, man! The sixties will never end! Oh. Back to motor mounts. I'd get it fixed. It's not a major bill and the repercussions from not fixing it can and probably will make you buy a new car sooner rather than later. I always have someone sit in the car and put in gear and then put it back in neutral with the brake being held. if the motor shifts then you have a weak or broken mount. like walt34 said if its bad get it fixed. sooner rather than later it will cause other problems.